In our efforts to add more Asian dishes to our repertoire, stir fry has become a mainstay. My favorite thing about stir fry is that virtually all of the work is done in prep, so once you’re there it’s just a few minutes of cooking and then you’re ready to serve! This particular stir fry is loaded with veggies and really is a complete meal in one dish. We served ours with quinoa instead of rice (due to not having any rice), and honestly I think I prefer the quinoa in this case – it really soaks up the sauce and is a little fluffier. You can substitute, add, or omit any of the vegetables involved if you don’t like them, don’t have them, or whatever. That’s my favorite thing about stir fry – it’s great for a “clean out the fridge night” (Friday, in our case, as our trash pickup is Saturday). 1. Rinse and cook the quinoa according to package directions. Cut the beef into small strips. Peel and mince the garlic, ginger, and red chile. Chop the mushrooms, the carrot, the bell pepper, and the green onions. Chop up the basil and set aside. Whisk all of the sauce ingredients together in a small bowl. Congrats! You’re almost done. 2. Heat a tablespoon or two of olive oil in a wok (or big frying pan) until hot and sear the beef until the outside is brown, but the beef isn’t completely cooked (it will cook more later). Transfer to a paper-towel lined plate. 3. Add a little more oil and stir fry the garlic, ginger, and red chile until fragrant (a minute or so). Then add the mushrooms, carrots, and about 1/4 cup of water. After another minute or so add the bell pepper, snow peas, and green onions. Stir fry another few minutes until the vegetables are a little tender (check the carrot). 4. 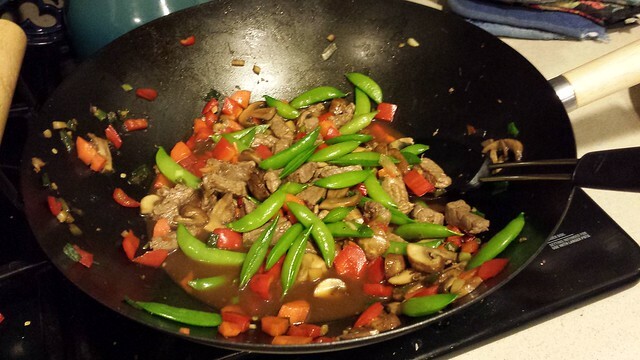 Add the meat back into the stir fry and pour the sauce over the top, stirring to coat everything. Once the sauce has soaked up into the stir fry, turn off the heat. Serve the stir fry over quinoa and top with a little basil.